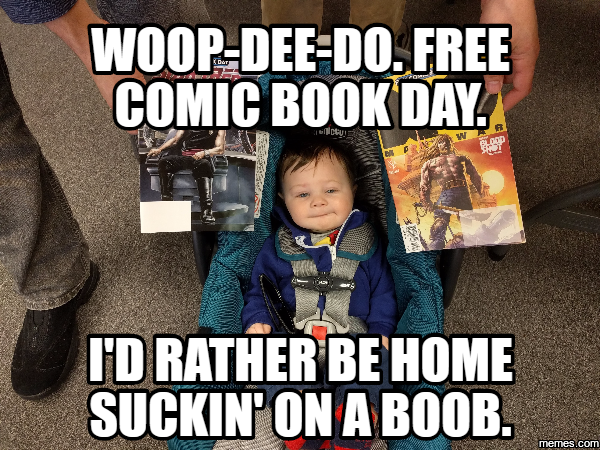 This past Saturday we took Lil G-Man to his first Free Comic Book Day, which for a comic book geek, is like having Christmas, Lollapalooza & Halloween all on the same day! Except…you know…you don’t have to be Christian, it doesn’t involve music and you don’t have to threaten anyone with tricks. However you do get free comic books, people do dress up as heroes and you will most likely bump into people that look like they belong in a music festival. Judging from the picture, I may have had a more fun time than G-Man did. Here are this week’s Monday Morning Meme Me options to choose from. Please pick your favorite or, as always, you can leave your own meme idea in the comments below! Previous Free Comic Book Day Is Tomorrow (May 6th)! Here Are The Titles Available & Where To Get Them For Free!